My name is Keith Harding. At the age of 65 I was diagnosed with an aggressive type of prostate cancer. Following a radical prostalectomy (shortly after the diagnosis) I made an uneventful recovery. Within one month I was out cycling approximately 25 miles per day and doing long long walks with my dog. I remain extremely active and enjoy a challenge. 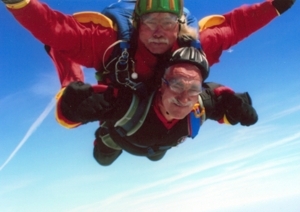 On my 67th birthday I achieved my dream and did a sponsored parachute jump to help raise funds for Rotherham Cancer Care and Challenge Cancer Through Adventure. Throughout this period I have had tremendous support and encouragement from Rotherham Urology Team and Rotherham Cancer Care, an after care service.. for people with Cancer. Challenge Cancer Through Adventure gave me the opportunity to realise my dream. I have managed to give a little back for all the help that is on offer.